Who stands to benefit from the creation of a second mega-hospital system in Massachusetts? And who gets left behind? As Beth Israel Deaconess Medical Center and Lahey Health continue to pursue their merger dreams, those questions are front and center. The answers have huge implications for the many residents of the state — many of them working-class and people of color — who worry about becoming collateral damage. The two hospitals would be the largest in a new entity that would form a major rival to Partners HealthCare, currently the undisputed big dog of the state’s health care system. Partners is also, by far, the state’s most expensive system, with a business model that formed a barrier to many low-income patients. Wednesday figures to be an important day for the Beth Israel-Lahey merger. The state’s Health Policy Commission will release a major analysis of the potential impact of the deal, which still requires approval from Attorney General Maura Healey and the federal government. Supporters of the merger say it will begin to fix a system nobody likes by creating a counterweight to Partners. Opponents say a second behemoth will make a shaky system worse. A relatively low portion of both hospitals’ patients are poor. My concern is how the merger would affect people who struggle to gain access to health care as it is — people in places like Roxbury, Dorchester, Lowell, and Lawrence whose health care could suffer if two big systems gobble up a limited pool of resources. Opponent Hanoi Reyes points to the relatively low percentage of Medicaid patients at Beth Israel and Lahey as evidence that the new system will not be especially welcoming to low-income patients. “They definitely have a record of serving higher-income patients,” she said. Ultimately, critics of the deal have two major concerns: that the creation of a second system will drive up prices and that doctors and that providers at community hospitals will be lured away by a new entity that can pay them significantly more. If those concerns pan out, the effect on smaller hospitals could be devastating. If such hospitals suffer a significant drop in patients that could force cuts in services and jobs. Some could be forced to close. 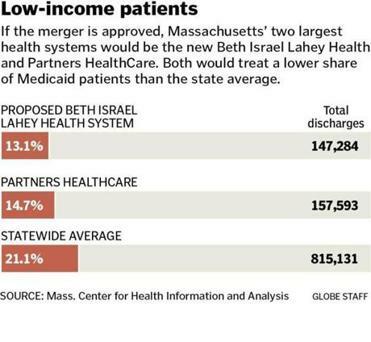 The Beth Israel-Lahey group insists that the merger will not adversely affect low-income communities. They say they treat plenty of Medicaid patients and support community health centers, and will continue to. But good intentions shouldn’t be enough to win approval for a deal with such sweeping implications. Ultimately, all eyes will be on Healey, who has the authority to block or impose conditions on the deal. Last week, she laid out her own concerns , emphasizing the potential for rising costs and increased barriers to care. Perhaps, the big hospitals are right that preserving the status quo would only prop up a system that doesn’t work. But someone has to ensure that what comes next doesn’t crush the people who can least afford it. That sounds like the kind of fight the attorney general loves to take on. Adrian Walker can be reached at adrian.walker@globe.com.